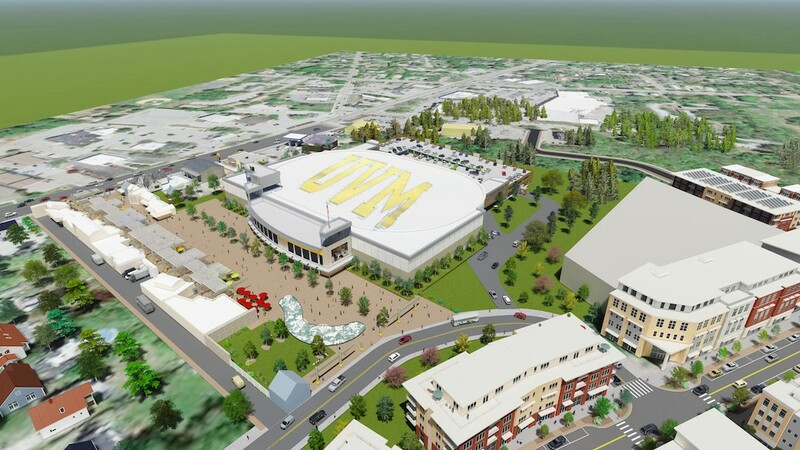 Dore & Whittier Architects, Inc.
A $60 million, 6,000-seat arena that would host University of Vermont hockey and basketball games — as well as conventions and concerts — could sprout in South Burlington's new downtown. Two locations top the list of possible sites: the parcel now occupied by the Rick Marcotte Central School adjacent to Williston Road and the ailing University Mall property on Dorset Street. City and UVM officials debuted the idea Tuesday at a press conference. 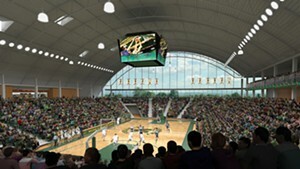 They announced the formation of a joint committee to study construction of a 230,000-square-foot, multi-purpose arena, tentatively named the Catamount Center. 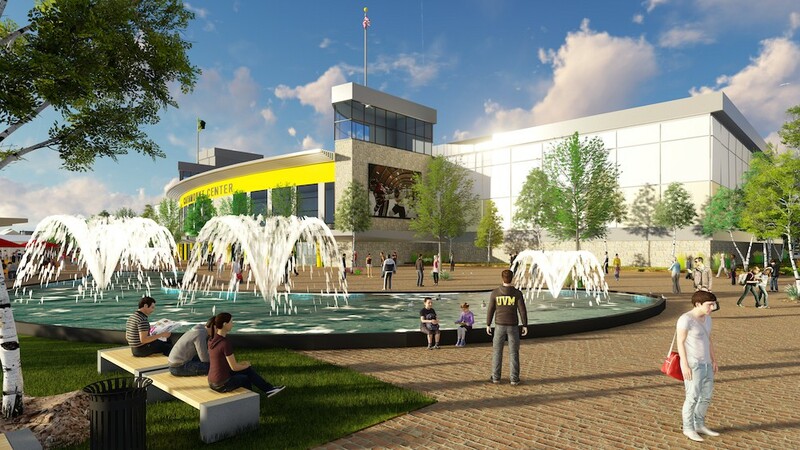 "This facility would provide a high-quality venue for UVM sports and other programs, concerts, family entertainment like Disney on Ice, and also provide convention and trade-show facilities that this area badly needs," said Kevin Dorn, South Burlington city manager. He went on to say the arena could provide a "powerful economic stimulus" for the region and become part of South Burlington's pedestrian-oriented, mixed-use City Center proposal. The city would own the facility, but seek financial assistance to build it from UVM and its donor base. Tax-increment financing and local-options taxes also might be tools to help fund the arena, according Dorn. 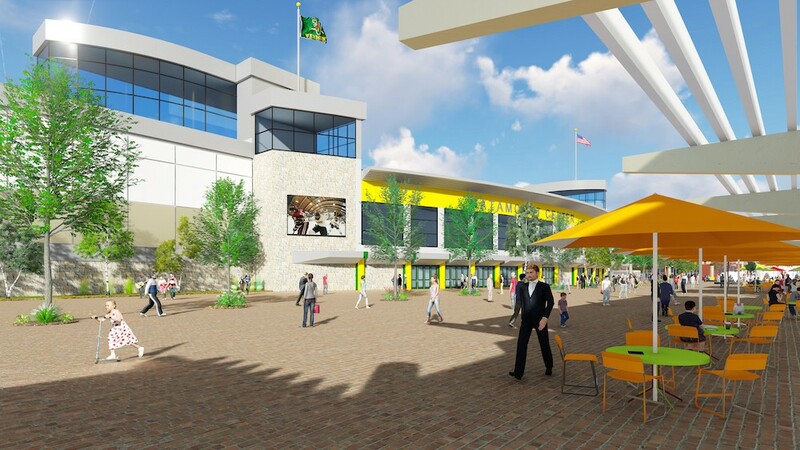 UVM has considered building a new sports complex — both on and off campus — for at least two decades. Tom Gustafson, vice president for university relations and administration, said at the press conference that the school is proud of its Division I athletes. "We're somewhat less proud of some of our facilities at the university," Gustafson said. "We've been looking at what we can do with them, given the fact that they were built at a time when our student body was about a third of the size it is today." Bob Corran, UVM associate vice president & director of athletics, also spoke about the inadequacy of current facilities. He said they do not meet the standard "we see at the Division I level, and they certainly are not at a level which really encourages our recruiting efforts." The new South Burlington arena would seat 5,000 for athletic events and as many as 6,000 people for concerts. That plan could change depending on the findings of market studies. UVM's hockey team now plays at Gutterson Field House, which has a capacity of about 4,000 and frequently sells out games. The basketball team plays at the 1963 Roy L. Patrick Gymnasium, which has about 3,200 seats. UVM is keeping other options open and is talking with the city of Burlington about potential partnerships for athletics at Memorial Auditorium, Gustafson said. The city of Burlington is planning to seek proposals for redevelopment of the auditorium parcel downtown at Main Street and South Union. 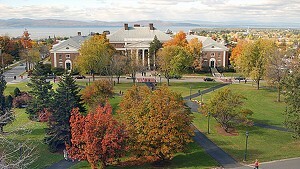 The study committee will produce a report by August 15 for UVM President Tom Sullivan and Dorn, who will then send the report to the UVM trustees and South Burlington City Council for consideration. The committee will explore locations, design needs, legal issues and financing. Both sites mentioned Tuesday are equally practical, Dorn said, although the renderings of the proposed facility focused on the Marcotte School parcel. The video and renderings showed new pedestrian access from Williston Road and connections to the downtown-style development that South Burlington leaders have been trying to build in the core of the suburb for decades. Thus far, the South Burlington School Board has declined offers to sell the 11-acre Marcotte School, which remains in operation. Some parents don't want to see the school shuttered. The arena proposal could put new pressure on the school board, which is currently weighing options. Meanwhile the owners of the University Mall have already announced their desire to revamp the aging retail center into a mixed-use development in line with the general goals of the South Burlington City Center vision. The arena would likely take up just a portion of the mall's acreage, if it advances. Todd Finard, who co-owns the mall, gave approval to have the site considered in the arena study. Dorn said that the city will seek approval from the Vermont Economic Progress Council to include the mall property in the South Burlington City Center's existing tax-increment financing district. The city is hoping for authorization from the state board by the summer. Marcotte school is already part of the City Center TIF district. If TIF subsidies are tapped for the arena, South Burlington city voters would first have to authorize bonds in connection with the project. Such a vote could happen as early as November, but would be more likely for spring of 2017, if the arena project moves forward.